An antique engagement ring would be a jewel that symbolizes the classic charm of the past. Literally speaking an antique ring would have existed for around 70-100 years or even more. Since it is fair to presume that such an old ring would have been worn quite often in the past, it might be too much to expect the jewel to have a perfect condition. To begin with an antique ring would carry a price tag that, is around 3 to 10 times the cost of the components (including metal and stones) invested in the jewel. You might find a high profile jewelry house that reconditions antique jewels like museum pieces but, expect to pay a stiff price for such a service. But the truth is that, young brides are seeking antique vintage engagement ring styles, that appear like one-of-a-kind pieces. The fact that very few of them are willing to foot an enormous bill for their speciall ring is another matter. Fortunately there exists an option that can be moderately priced and deliver quality combined with durability - custom engagement rings made with antique styles. The modern trend is for jewelers to use hi-tech processes to make jewelry production easy, computer aided designs and 3D block makers are getting to be more affordable. However, these mechanized production processes cannot deliver the fine quality and flow expected for vintage style jewelry. Very few jewelers control the complete production process from designing, wax carving, block making, rubber moulding, wax injection, casting, filing, polishing and gem setting - don't forget custom gem cutting. What this means is that, your options for getting a classic look and feel for your antique ring stylle are not many. The good news is that, our production facility has always relied on the talent and expertise of the finest jewelry craftsmen and artisans. Every gem that we set in our fine jewelry is procured directly from the mining sites, careful inspection is made by highly experienced gemstone experts. Once the rough gem is selected, some of the best gem cutters reveal their decades of experience as they precisely cut each gemstone. Complete control over the entire production process is excercised and rigid quality control checks are performed at multiple points in the production cycle. This intense operation allows us to deliver the finest custom jewelry in both contemporary and traditional styles. And to allow a wide base of jewelry lovers to experience our fine quality, we custom make jewelry in gold, sterling silver and platinum. If you ever thought that our fine antique style jewelry would be very expensive, we have a pleasant surprise for you. By controlling the entire production process we keep multiple broker commissions and outsource margins away - a very reasonable margin is all that we add to each jewel crafted. Another interesting development related to bridal rings has also made antique and vintage engagement rings affordable to many budgets. While most of the antique rings you come across would be lavished with expensive rubies, sapphires, emeralds and diamonds - today's bridal scene has come to embrace colored gemstones. When the British Royal Family celebrated the highly publicized wedding of Prince William, they did it with a blue sapphire gem for the bride and not a gigantic diamond! The growing knowledge about colored gemstones coupled with a 'here to stay' trend for engagement rings with colored gems, has opened up a tremendous array of gems for that special ring. Pushing the concept of custom made jewelry to the limit, we allow you to choose just about any gemstone that you fancy for your antique engagement ring - you need not limit yourself to what you see on our website. Our Rings: When you choose the design for your vintage style engagement ring, you want something unique and something that suits your style and personality. While we do present a few suggestions for your antique engagement ring below, use the ideas merely as a start - let your imagination flow and discuss your ideas with our experts. You can send us your own images and sketches by email. But if you are really impressed with one of our designs, keep in mind that every aspect of the jewel can be customized to suit your liking. The same is true of the gem selection for your engagement ring, don't limit your selection just because you do not see the gem that you love on our website. Let us know what gemstone you need, we will comb the entire planet for that one gem - and custom cut it just for your jewel. We realize that this is a very special ring for you and would be worn on one of the most precious days of your life, we want you to take your time and make the right choice. Keep discussing your requirements with our team of experts at sales@kaisilver.com and when you are sure that, all your questions have been answered work to confirm the order with payment. Should you decide to quit working with us at any point and choose another jeweler, we will hold no grudges and wish you all the very best. The ancient Asian princess bridal ring, a timeless classic with a fine collection of handpicked gems. You choose the gold or silver option and the gemstones for each of the positions. A bridal jewel that truly symbolizes a priceless antique, custom made by our skilled artisans ... more. Surely one of the most meaningful concepts for an antique bridal ring. 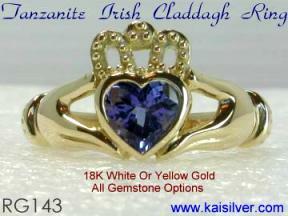 Capturing the true meaning of the 4 century old claddagh story. A humble fisherman turned slave, crafted the first claddagh ring for his beloved. The ring has come to symbolize love, loyalty and friendship .... more . Inspired by two ancient royal sightings, this is the antique ring style fit for a princess. The design draws inspiration from the head dress worn by many a royal princess centuries ago. A similar creation was historically worn as an extravagant arm band by the royals. Gem stones of your choice and custom made in all sizes, gold or 925 sterling silver ... more. A bridal ring that has remained popular for many decades, a single gemstone set on a finely crafted gold or 925 silver mount. The cut out design on either side of the center oval gem get highlighted against the finger skin that gets exposed when the ring is worn. A unlimited range of gems for you to choose from, makes this jewel an attractive proposition ... more. If you wish to order a mens ring or any other jewel from us, do email our support experts at sales@kaisilver.com We do not wish to push you through the process by those BUY NOW gimmicks! All our custom jewelry is created for you and can be personalized to suit your preferences. The design, metal, dimensions and gemstones for your ring can all be tuned to your liking. We can infact make a completely different ring or jewel based on your design concept. Our support team is trained to provide advice and suggestions, we do not pressurize them to achieve sales targets by encouraging buyers to make an impulse purchase. Email us the item number, your choice of gold or silver and the gemstone that you prefer. If you need a gold ring also mention your selection for 14k or 18k gold, the options for yelllow or white gold are always provided. We prefer payment through Paypal as it is safer for you and us. We also bank transfers and details for this can be provided on request. You can register for a Paypal account at no charge from their website at www.paypal.com You will never need to disclose bank or credit card details to a seller, if you use Paypal. This provides better security for your confidential information. Each jewel at Kaisilver is tailored to include individual customer preferences, we do not work with fixed moulds or catalogs. Every gem stone is handpicked and closely inspected before being custom cut. These processes require skilled craftsmanship and we are fully equipped to do it. The production time for your jewel would be around 4 to 6 weeks from the date of payment being made and order confirmation. Shipping is through FEDEX and you will receive the tracking number the moment the item ships. More than 10,000 gem and jewelry lovers from 17 nations rely on us for all their gem and jewelry requiremetns. We are the world's leading online highend custom jewelry provider. 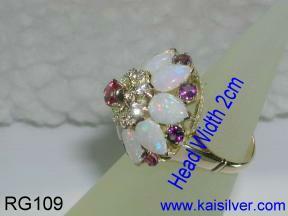 We welcome both gold and silver jewelry orders with gem stones of your choice. The designs for your custom jewelry can be yours or ours, all design modifications are possible. We are the only highend jewelry provider to provide the same attention, craftsmanship, design and gemstones for both gold and sterling silver jewelry. 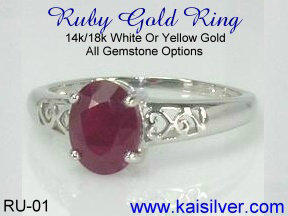 Kaisilver buyers include jewelry lovers from all walks of life. Fashion models, journalists, doctors and surgeons, politicians, hotel and casino owners, members of the armed forces, sportsmen, students, professors, lawyers, financial experts, housewives and others form our esteemed clientele. We welcome even the smallest order and will be glad to sources even one single piece of a hard to find gem stone for you. Do contact our support team at sales@kaisilver.com with any queries or requirements that you might have. 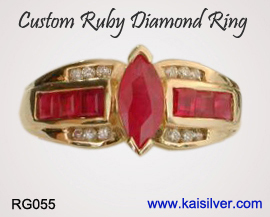 Dear Kaisilver Associates, I would like to take this opportunity to personally offer my recommendation of Kaisilver for top-quality custom jewelry. I located Kaisilver through the internet and was, as you might imagine, somewhat apprehensive about sending money to people I had never met. Nevertheless, I used PayPal and we began working on a custom-designed gold pendant for me.... Associates of Kaisilver worked with me every step of the way graciously, courteously, and promptly, accepting the ideas that would work and recommending alternatives to ideas that would not work..... Another part of the process I would like to emphasize is Kaisilver's thoroughness and conviction to customer satisfaction.....I am pleased to recommend Kaisilver for your custom jewelry needs and feel certain they will meet your expectations with the same dedication demonstrated toward me. Mr.Carl Weeder, U.S.A.
Be informed, educated and entertained by one of the industry's most respected newsletter. The Kaisilver gems and jewelry newsletter is packed with frank and honest content related to gemstones and jewelry. We do not SPAM and we do not reveal your email address to any third party. Our mailing list is maintained by a third party to ensure that, all members have voluntarily agreed to join the list. We follow a system of double confirmation before adding an email address to the Kaisilver mailing list. Once you have subscribed to the list, you will receive and email that requests you to re-confirm your intention to join the list. The box below can be used to Subcribe and Unsubscribe from the Newsletter. The Content On This Website Is Protected By International Copyright Laws, You Are Advised Not To Reproduce It In Any Form.